ICANN (the governing body for top level domain names) requires domain registrants to validate their contact details via the email address held against their domain. This is not a HotDoodle rule, it is a rule of the worldwide domain system. You MUST do this or you will lose the use of the domain. "Please validate your HotDoodle domain name(s) as soon as possible"
You will see a screen similar to the one below. Click the checkbox, submit, and you are done. Alternatively, you may forward the email to domains@hotdoodle.com and we will click the links for you. domain name(s) and we require that you validate your new contact information. WHOIS Data Reminder Policy (WDRP) email, or a renewal reminder notice. Q: Who gets the email? The email is sent to the address listed as the doman's "Organization" contact and might take a day to be sent. Follow-up emails are also sent to the domain's "Administration", "Billing", and "Technical" contacts. Q: Why didn't I get the email? The emails are generated nightly, so you may need to wait a day. Also, there is no retroactive domain validation, and validations are not sent if the combination of First name, Last name, and Email Address has previously been validated. Q: What if I deleted the email? Further reminders will be sent on days 5, 10 and 13 of this 15 day period to ensure that you don’t forget to validate your details. Q: How long do I have to validate my email address? You need to validate your email address within 15 days from the point that you first receive the notification. Q: What happens if I don’t validate my email address? Q: What happens when the domain is suspended? Suspended domains simply show a blank page and do not have their DNS settings modified. Q: Can't HotDoodle handle this for me? 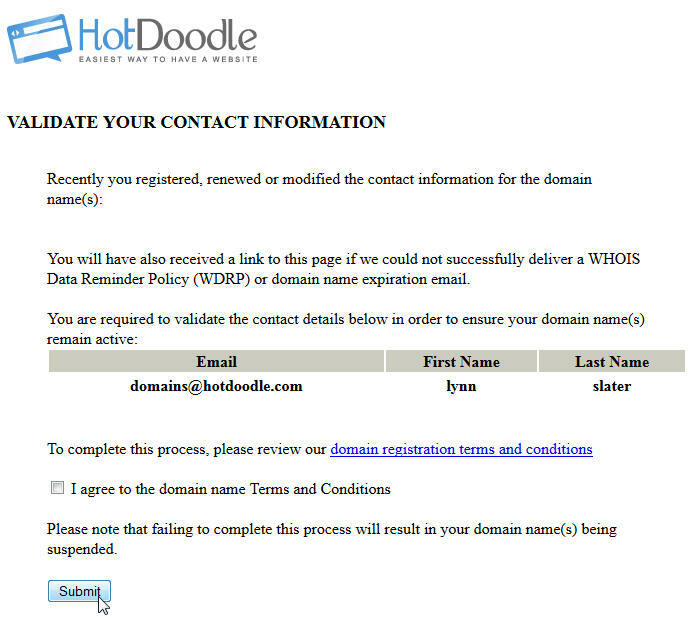 HotDoodle will not receive this email and without it we cannot validate the email address. If you forward the email to domains@hotdoodle.com we will click the links for you. Q: What triggers a validation? Validation is triggered when you register, transfer, or modify the contact information for a domain. It is also triggered when a WHOIS Data Reminder Policy (WDRP) email or a renewal reminder notice could not be delivered. Q: What other emails are sent? yourdomainname.com has been registered via HotDoodle - sent immediately upon registration, this email contains all that you need to administer the domain indepently of HotDoodle. Your HotDoodle Domain yourdomainname.com needs to be validated - sent immediately upon registration to the site owner email (may differ from the domain owner email). Q: Where are the nitty gritty details? Details are in this technical FAQ. Here are the official rules requiring this step.